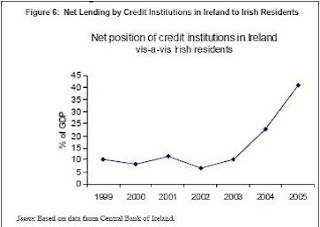 Following Manuel's last post, and the fact that Ireland is to some extent in the news this week, I thought some consideration of the recent dynamics of the Irish economy might be in order here on GEM. 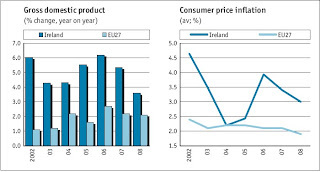 In order to begin to contextualise and address what has been happening in Ireland I have been reading through Chapter Two of the recent European Economic Advisory Group (EEAG) report on the European Economy 2007. The chapter, which is entitled Macroeconomic adjustment in the Euro Area: the Cases of Ireland and Italy, asks a number of important questions and makes for interesting reading. 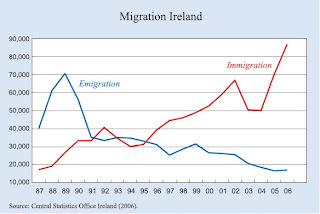 In this post (which which I hope will be followed by two more, one on Italy, and one attempting to spell out what I think can be learned from making this comparison) I will follow the EEAG lead, and begin the process of looking at two eurozone countries as case studies (Ireland and Italy) of a somewhat more general phenomenon - and in particular to ask the question what exactly "capacity" means and implies in each of these cases, and just how has the application of a single interest rate by the ECB affected the ongoing capacity of each of the economies concerned. So now, and without more ado, let's take a look at Ireland. NB. As I indicate at the start, this post is the first installment of a much longer review process. More to come. Next stop Italy. Luck of the Irish: PM Bertie Ahern Set for a Third Term in Office - or is he? Irish Taoiseach (prime minister) Bertie Ahern appears set for a third term in office, following a general election last May 24 in which Fianna Fáil (Soldiers of Destiny), led by Ahern, remained by far the largest party in the Republic of Ireland, with 78 of 166 seats in Dáil Eireann, the House of Representatives. However, Fianna Fáil's coalition partners, the Progressive Democrats, fared badly in the election, losing six of their eight Dáil seats - including that of party leader and Tánaiste (deputy prime minister) Michael McDowell - and the ruling coalition lost its overall parliamentary majority. Although Fine Gael (Gaelic Nation) - the main opposition party - scored major gains and went from 31 to 51 seats in Dáil Eireann, its "rainbow alliance" partners, Labour and the Green Party failed to improve upon their previous election showing: the Labour Party lost one of its twenty-one seats, while the Greens won six seats, the same number as in 2002. In all, the three parties won 77 seats between themselves, whereas Fianna Fáil and the Progressive Democrats hold a combined total of eighty. Sinn Féin, which in recent years has become the second largest party in Northern Ireland (which remains part of the U.K.) and the largest party among that province's Catholic community, lost one of its five seats, while the small Socialist Party lost its single deputy. The Republic of Ireland has a long tradition of independent parliamentarians, and this year was no exception with five independents elected as deputies, but their number is considerably lower than in 2002, when thirteen non-party candidates won seats in Dáil Eireann. Nearly three weeks after the election, Fianna Fáil reached a coalition agreement with both the Greens and the Progressive Democrats, under which Bertie Ahern was elected by the 30th Dáil as head of government for a historic third term on Thursday, June 14, 2007. 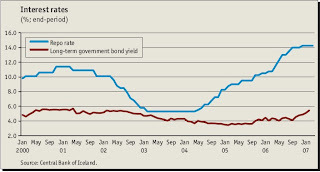 Voters in Iceland go to the polls on Saturday, May 12, 2007 to choose members of the country's unicameral legislature, the Althing. Parliamentary elections in Iceland are carried out by proportional representation, and the electoral system - reviewed in Elections to the Icelandic Althing - bears strong similarities to the systems used in Scandinavian countries for national elections. Although Iceland has a total population of only 300,000 inhabitants, the country has developed a lively multi-party system, broadly similar to those in place in other Nordic nations, yet distinct in a number of ways. First, unlike in the other Nordic countries, Iceland's party politics have been dominated by the conservative Independence Party, which has been the largest single party in every general election held in Iceland since 1944, when the country broke its union with Denmark and became a republic. Second, until fairly recent times Iceland's Social Democrats were much weaker than their Nordic counterparts, and usually alternated in third place with the left-socialist People's Alliance. However, in 1999 the Social Democrats, the People's Alliance and a feminist group, the Women's Alliance, joined forces and established a social democratic Alliance, which went on to displace the agrarian-liberal Progressive Party as the country's second largest political force. Third, right-left coalitions between parties that otherwise would be political adversaries have been a common occurrence in Iceland (but remain fairly rare in the other Nordic countries, with the notable exception of Finland). No party has held an overall parliamentary majority since the proclamation of the republic in 1944, and the country has been ruled by a succession of coalition cabinets. The Independence Party, which has taken part in most governments, has been in office since 1991, in coalition with the Social Democrats until 1995, and since then with the Progressive Party. While the Alliance was largely successful in bringing together Iceland's diverse left-wing groups and emerged as a major challenger to the Independence Party in the 2003 Althing election, some members of the original parties (mainly from the People's Alliance) did not agree to the merger and established the Left-Green Movement as a leftist alternative to the Alliance. Both the Left-Green Movement and the Liberal Party - an Independence Party breakaway - have been represented in the Althing since 1999, along with the three larger parties. The election had a voter turnout rate of 83.6%. Although the opposition parties won an overall majority of the popular vote, the Independence-Progressive coalition government of Prime Minister Geir H. Haarde nonetheless survived by the narrowest of margins, hanging on to a one-seat majority in the Althing. Haarde's Independence Party improved its standing with respect to the 2003 parliamentary election, but the Progressives had their worst general election result ever and slipped to fourth place. Iceland's main opposition party, the social democratic Alliance also lost ground in the election, but the Left-Green Movement polled strongly, becoming the country's third largest party. Finally, support for the Liberal Party remained stable, while the environmentalist-oriented Iceland's Movement failed to secure parliamentary representation. Following the close election outcome, the Independence and Progressive parties chose to discontinue their coalition agreement, and the Independence Party subsequently reached an agreement with the Alliance to form a coalition government headed by Prime Minister Haarde. 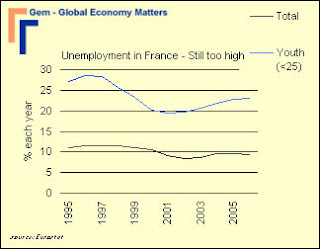 So, is the French economy really in such bad shape? In this note, which accompanies Manuel's excellent posts on the French Presidential elections, I will try to answer just that question. In fact I will argue that France indeed faces important and non-negligible challenges in the immediate future, among them most notably how to better manager the y-o-y and long term evolution of public finances, as well as the need to reform a rather rigid labour market. 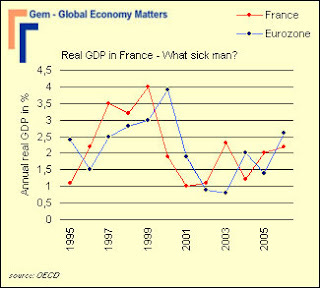 However, I will also argue that the invocation of France as the new sick man of Europe represents a fallacy and that such analysis does not adequately take into account the (potential) long term fundamentals of the French economy which look healthier than those in many of France's European peers. 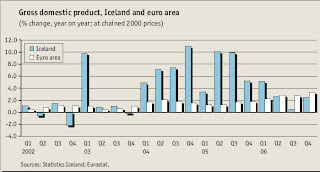 France and the Eurozone – A Laggard? Much of what recently has been written and said about the relatively poor state of the French economy compared to the other large Eurozone countries comes on the back of 2006 which saw a record year of economic growth in GDP in the Eurozone and indeed the whole of Europe. And clearly looked at in this context France would seem to have fallen somewhat behind Germany, for example, which as well all by now know only too well posted an impressive growth rate of 2.6% compared with France’s rather more modest 2%. Yet, if we take a look at real GDP growth in France over the past 12 years there is nothing to suggest that France is not, in fact, by and large monsieur average in terms of economic growth in the Eurozone. 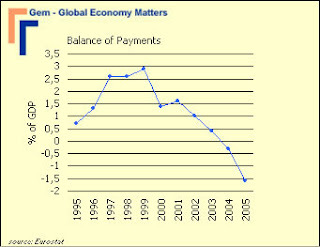 This overview puts in some kind of perspective the rather hasty conclusions being drawn on the basis of what is, after all, only is one year's relative performace, and, as Emmanuel from AFOE points out, this clearly is far from constituting a trend, at least not the way I have been taught in economics it doesn't. Now none of this means that France does not face important economic challenges, and it certainly does not mean that France could not do with some badly needed reforms. 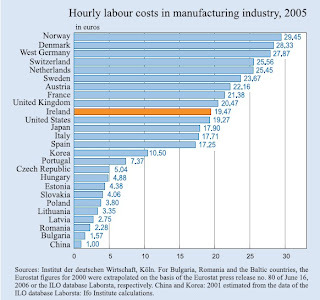 Most notably, France needs to reform its rigid labour market. I will not dwell on the very complicated structure of France’s labour market here but there is no doubt that France needs to fundamentally rethink and re-invent the notion, width and depth of job contracts and on that same note re-invent its social security scheme (la protection sociale) whose two tier employee/employer financing is at the heart of a troubled French labour market. And the problem is of a somewhat pressing nature. In particular, and despite the fact that I shall talk rather favorably of French demographics below, France, along with other developed economies, is set to age rapidly over the next 20 years as a result of the ongoing demographic transition. This means that the labour market needs to be a well-functioning one so that the supply side of the economy is not constrained as workers become an ever scarcer resource compared to elderly dependents. Especially noteworthy in this context is youth unemployment in France, which is running at rather alarming levels, as is demonstrated by the figure below. 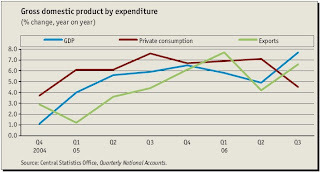 Another aspect where France needs to improve its performance is in terms of the management of public finances. 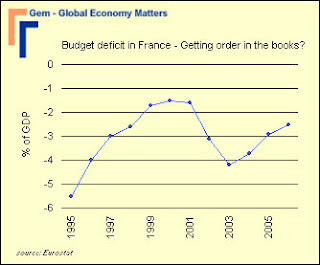 Since 1995 France has been running a structural budget deficit and although many will take comfort in the fact that it is now below the dreaded threshold of 3% set by the growth and stability pact under the EU framework there are still fundamental economic issues to be resolved related to getting France’s books in good financial order. The first issue to be addressed is, I think, of an institutional nature, since the lingering budget deficit first and foremost tells a tale of a state apparatus where expenses are quite simply badly managed compared to receipts. But in terms of the broader and longer term picture we need to talk about the structural drivers of public debt, and here it is clear France also needs to improve. More worryingly, as also aptly noted by Eric Chaney (linked above), the window of opportunity for France - as with most other major European countries - is closing fast due to the pace of the evolving demographic transition. Chaney presents estimates which show that liabilities will rise to 120% of French GDP as a result of the ageing process alone. This will of course only be exacerbated if France continues on its current course so there is good reason to think in terms of implementing reforms and changes today rather than tomorrow. Now taking up the baton on the demographic situation in France, as I noted above I am going to speak rather favorably about this. In this context I am, I am afraid, only going to offer a relative exercise as it were, and simply compare with France its European neighbours Italy and Germany. Now if we look at fertility in France we in fact get a rather different picture to that which is to be found in Italy and Germany. 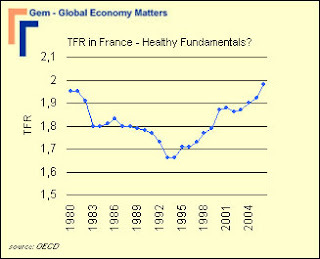 In France fertility rates have rebounded since the middle of the 1990s and are now close to replacement (a situation which has only really be attained by the US among the developed nations), and if we are all busy criticizing French public policy in many areas we might perhaps do well to recognise that pro-natalist policies in France do seem to have had some effect, and this is one thing which certainly seems to have been done well. This relatively favourable fertility situation by no means saves France from a structural shock to its population pyramid as the effects of the demographic transition ripples across the age cohorts, but it does mean that compared to Italy and Germany where fertility levels stubbornly continue to lingers close to the 1.3/1.4 range the future does look just a little bit brighter for France, with of course the proviso that future trends in net migration represent an unknown in all cases. The key point on fertility however is that although the picture points to an apparent return to 1980 standards so to speak the figure hides the cumulative effect on the size of future generations. 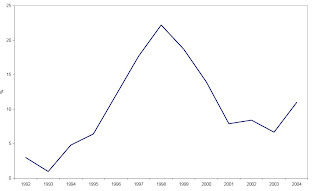 As such the size of the various cohorts currently passing through their reproductive ages is smaller than that of the preceding ones, so the absolute numbers of children being born will be commensurately lower (with pension sustainability implications), and again all of this means that the crude figures need to be treated with some caution. 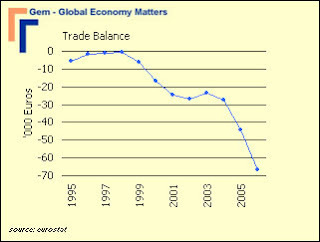 By itself, a trade deficit is not a symptom of macro illness (nor is a government budget deficit). Diverging domestic demand growth between countries having similar productivity and cost trends generates temporary surpluses and deficits, with temporary maybe meaning several years. That Germany and Japan have large trade surpluses is largely explained by the slow growth rate of their populations and of their domestic demand. That is why it is more revealing to look at export performances. Essentially, I think Chaney is spot on in terms of his focus on the structural nature of French export business and most notably the relative lack of innovation when compared with other European countries. Yet there is another subtle point here I think which is ever so important both in a European and global context. In a world where populations are ageing, and where trade surpluses are ballooning and becoming structurally inbuilt in some of the oldest societies, we logically also need importers to make the global books balance. In fact, as was demonstrated by the figure in my recent piece on global decoupling France constitutes Germany biggest export market in terms of total volume on a country basis. Given that background it is clear that the growth of Germany and France is of somewhat a symbiotic nature (like growth in China and the US?) which is also why this idea of France as the sick man of Europe seems to be rather inappropriate I think or at least why we need to think about eurozone and cross-country dynamics too. Looking into future of France with a new president at the rudder it is my hope and optimistic belief that Sarkozy will now command the legitimacy to carry out what is sure to be big changes in French society. Hopefully theses changes will be for the better both for the French and for the European economy. 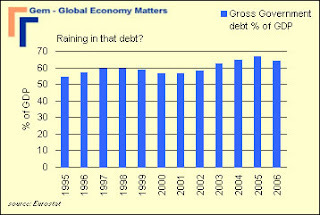 To finish where I started with Eric Chaney's notes over at Morgan Stanley’s GEF (see links above) I do not agree with the overall label of France as the new sick man of Europe. Essentially, Chaney makes a whole lot of sense in his analysis and as I have also noted above France indeed needs reforms in order to combat high unemployment as well as shaky public finances. 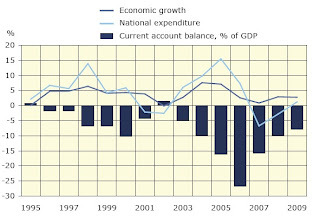 The only qualifier that I would attach Chaney analysis is on France’s trade deficit which actually is much needed to sustain growth in the Eurozone as a whole and once again I feel as if the account of how demographics affect capital and trade flows is somewhat missing in the general analysis. In terms of Europe I still believe that the scarlet letter of sick man rests firmly on Italy mainly due to its government debt at about 100% of GDP, a problem which poses a fundamental risk to the future of the Italian economy, as well as to its future membership of the Euro and public pay-go benefits system; all this of course especially given the demographic realities. Put another way, I don’t think Chaney’s analysis on France is flawed as such, but his headline is.